Right now is the time to get GREAT at doing video as it is one of THE most effective ways to connect with your audience and it is only going to get even BIGGER in the next few years! If you do not get on the video train you are going to be left at the station and leave a lot of revenue on the table. #theglamtrainisleavingthestation! 1. Lack of knowledge of the technical and equipment side of things (lighting, framing, sound, background, camera, editing, etc.). Without the help of an expert, you can spend hours researching and guessing on Amazon and YouTube which pieces of equipment you should get. Guessing and hoping do not set you up for success as quickly as having it all in one place, curated by an expert! I have listened and DONE! 2. Lack of confidence in self and on-camera delivery (aka FEAR of judgement). How many times have you said, "I'm afraid I will forget what to say!...I might look stupid on camera!...I hate my voice and the way I look on camera!...I always ramble when I get in front of the camera and cannot get to the point effectively to engage my audience!...What if I have haters?..." And the list goes on! What if you had templates, scripts, mindset tools to increase your confidence, and delivery techniques that will help you feel more confident?!? CHECK! DONE! 3. And what about the challenge of content creation? Ever had the thought, "I don't know what to say?...How can I stay consistent in getting on video when I'm afraid of running out of things to talk about? I keep starting and stopping because I cannot think up ideas and I know that lack of consistency can cause a drop in engagement. What if you had resources that will help you create and deliver content in an inspired and joyful way what most effectively serves your clients' urgent needs so that they turn into raving fans? CHECK! DONE! And these challenges got me to thinking...how I can help glam boss babes like you overcome these challenges with knowledge, power, fun, ease, and (if you know me...) a touch of glamorous luxury (I just can't help myself! Sorry...not sorry! xoxo)? I need the kit now! Aren't you ready to take the guess work out of creating your social media videos when it comes to all the technical aspects, and confidence in on-camera delivery and content creation? Good news! 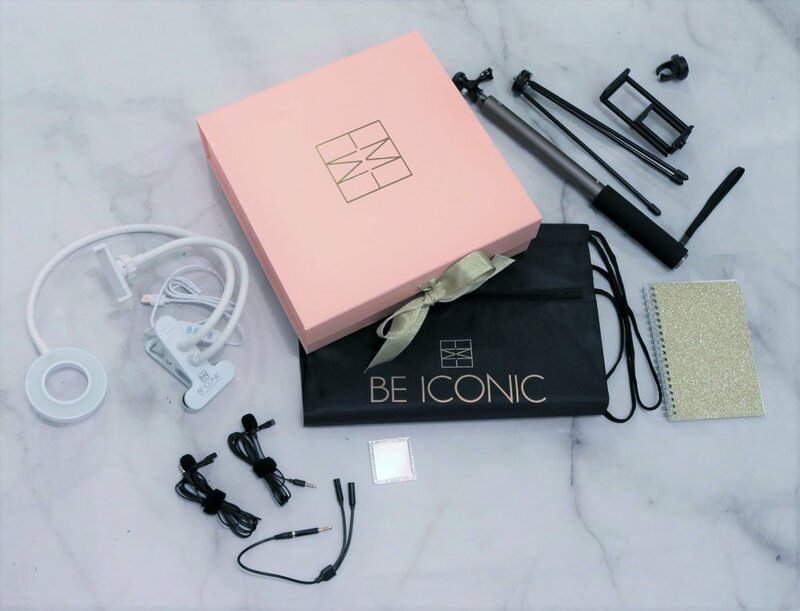 I have listened and created a product of all the equipment you need in one place along with included and optional additional online training for the glamorous boss babe that you are that addresses all the technical, confidence boosting and content creation challenges, while supporting you to express yourself in your own ICONIC way! What's included in The Video Glam Cam Kit™!?! All the essential equipment needed in one place, plus introductory online training on how to get started! Find out below why former Real Housewife of Dallas, now Media and Empowerment coach, Tiffany Hendra, loves the Video Glam Cam Kit! 1. A light, yet sturdy selfie-stick that adjusts and extends to 59 inches with bluetooth remote control that can hold your phone, DSLR camera, or Go-pro. 2. 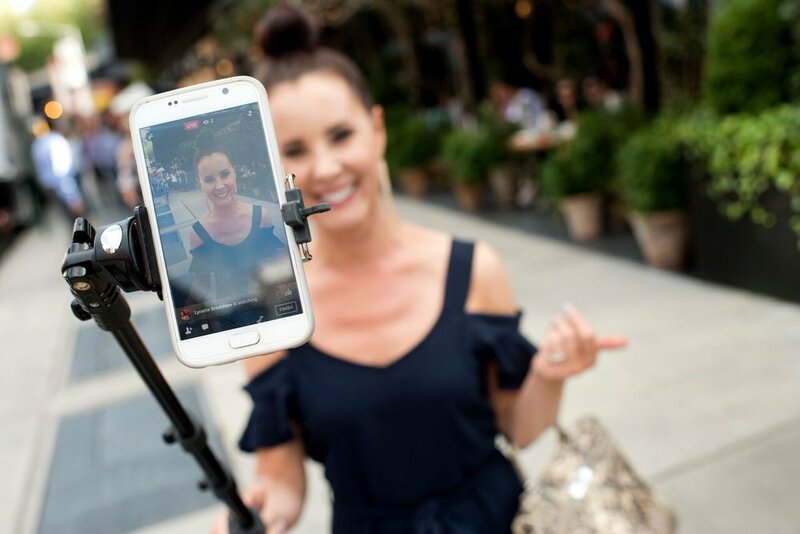 A sturdy tri-pod that connects to the selfie-stick for an additional 10 inches in height. 3. Two microphones that can be connected by an included "y" connector so that you can do interviews where both of you can be heard. I cannot tell you how many times I have wanted to do an interview and had sound issues because I could only use one mic! Not anymore! #soundiseverything! 4. (my fav!) A white adjustable ring light (10 levels of brightness and 3 settings for lighting color...cool, warm and a combo), with an adjustable arm that connects with a clamp to a desk, or can be wrapped around the fabulous tri-pod/selfie-stick. It also has an additional bendable arm that can hold your phone if you are not using your tri-pod. This connects via USB, so can be plugged into your computer, or block charger for your phone into the wall. I am SO excited about this piece!!! 5. A blinged out mirror to connect to the back of your phone to either check yourself before your recordings, or to help you when doing videos from the back camera (which, by the way, is a stronger camera!). 6. A beautiful journal to record your thoughts, take notes, brainsstorm your storyboards, etc.! 7. All this fits into a fabulous drawstring bag that reminds you to always #BeIconic! 8. A starter video training to get you all set and empowered to use all your equipment like a rock star! Find out why a network marketer, former journalist/now PR specialist and one of LA's top Success Coaches love the kit! Additional Trainings to Take Your Kit Use to the Next Level! How to videos available, include the following, each $47; bundled together $147. You can find each HERE. I am ready to order my Glam Cam Kit™! Welcome & Congratulations on taking your next step toward being ICONIC in your business!!! I look forward to you receiving your Video Glam Cam Kit™ and me having the opportunity to serve you online! Return policy: if any part of the kit is defective, you have 30 days from receipt to return it for exchange. See Terms of Service/Purchase below. For specific questions on the product, our affiliate program, or white labeling the Video Glam Cam Kit™ with your own branding, please contact our team at info@thevideoglamcamkit.com, or 972.869.1519.